Large polycyclic o-(trimethylsilyl)aryl triflates are easily obtained by reaction of commercially available bisaryne precursors with cyclopentadienones. The transformation involves controlled generation of one of the aryne functionalities, trapping by Diels–Alder reaction with a dienone, and chelotropic extrusion of CO. 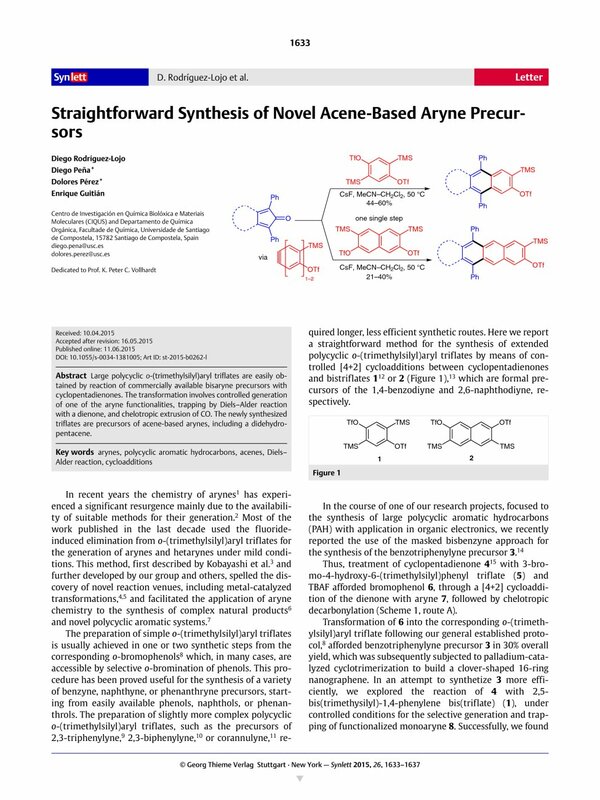 The newly synthesized triflates are precursors of acene-based arynes, including a didehydropentacene. Supporting information for this article is available online at http://dx.doi.org/10.1055/s-0034-1381005. 16 General Procedure To a solution of bisaryne precursor 1 or 2 and cyclopentadienone 4, 10, or 11 (110 mol%), in 2:1 MeCN–CH2Cl2, finely powdered anhydrous CsF (120 mol%) was added, and the mixture was stirred at 50 °C under argon atmosphere for 12 h. The solvent was evaporated under reduced pressure, and the resulting mixture was purified by column chromatography (SiO2, hexanes–CH2Cl2) to isolate the corresponding o-(trimethylsilyl)aryl triflate. In some experiments, the intermediate Diels–Alder adduct (e.g., 9) was detected in other fractions eluted from the column, which were collected, concentrated under vacuum, dissolved in tetrachloroethane, and refluxed for 12 h. Evaporation of the solvent under vacuum and column chromatography (SiO2, hexanes–CH2Cl2) of the residue afforded an additional portion of o-(trimethylsilyl)aryl triflate. 9,14-Diphenyl-12-(trimethylsilyl)benzo[f]tetraphen-11-yl Trifluoromethanesulfonate (3) Reaction of 1,3-diphenyl-2H-cyclopenta[l]phenanthren-2-one (4, 243 mg, 0.637 mmol), 2,5-bis(trimethylsilyl)-1,4-phenylene bis(trifluoromethanesulfonate) (1, 300 mg, 0.579 mmol), and CsF (105 mg, 0.695 mmol) in MeCN–CH2Cl2 (2:1; 9 mL) afforded 3 (218 mg, 58%) as a greenish solid; mp 219–221 °C. 1H NMR (250 MHZ, CDCl3): δ = 8.29 (d, J = 7.3 Hz, 2 H), 8.13 (s, 1 H), 7.85 (s, 1 H), 7.59 (d, J = 8.5 Hz, 2 H), 7.54 (m, 5 H), 7.54 (m, 5 H), 7.41–7.36 (m, 2 H), 7.04–6.98 (m, 2 H), 0.33 (s, 9 H) ppm. 13C NMR (63 MHz, CDCl3): δ = 152.6 (C), 140.9 (C), 140.5 (C), 136.8 (CH), 135.4 (C), 135.2 (C), 132.7 (C), 132.3 (2 CH), 132.2 (C), 132.1 (2 CH), 132.1 (C), 131.9 (C), 130.8 (C), 130.6 (C), 130.55 (C), 130.50 (CH), 130.4 (CH), 129.8 (C), 129.3 (C), 129.1 (2 CH), 129.0 (2 CH), 128.0 (CH), 127.9 (CH), 127.3 (CH), 127.2 (CH), 125.9 (2 CH), 123.3 (2 CH), 115.7 (CH), –0.8 (3 CH3) ppm. MS (EI): m/z (%) = 650 (30). HRMS (EI): m/z calcd for C38H29F3O3SSi: 650.1559; found: 650.1563. 5,6,7,8-Tetraphenyl-3-(trimethylsilyl)naphthalen-2-yl Trifluoromethanesulfonate (12) Reaction of 2,3,4,5-tetraphenylcyclopenta-2,4-dien-1-one (10, 329 mg, 0.858 mmol), 2,5-bis(trimethylsilyl)-1,4-phenylene bis(trifluoromethanesulfonate) (1, 404 mg, 0.780 mmol), and CsF (142 mg, 0.936 mmol) in MeCN–CH2Cl2 (2:1; 11 mL) afforded 12 (305 mg, 60%) as a white solid; mp 249–251 °C. 1H NMR (300 MHZ, CDCl3): δ = 7.89 (s, 1 H), 7.59 (s, 1 H), 7.32–7.20 (m, 10 H), 6.92–6.87 (m, 10 H), 0.30 (s, 9 H) ppm. 13C NMR (75 MHz, CDCl3): δ = 152.8 (C), 140.7 (C), 139.9 (4C), 138.7 (2 C), 138.5 (C), 138.3 (C), 136.9 (CH), 133.4 (C), 131.1 (3 CH), 131.1 (4 CH), 130.9 (2 CH), 130.5 (C), 127.7 (2 CH), 127.6 (2 CH), 126.9 (CH), 126.7 (4 CH), 125.7 (CH), 125.6 (CH), 118.4 (q, J = 320 Hz, CF3), 116.3 (CH), –0.9 (3 CH3) ppm. MS (EI): m/z (%) = 652.3 (70) [M+], 504.3 (14), 293.3 (41), 147.1 (43). HRMS (EI): m/z calcd for C38H31F3O3SSi: 652.1715; found: 652.1713. 9,14-Diphenyl-12-(trimethylsilyl)dibenzo[de,qr]tetracen-11-yl Trifluoromethanesulfonate (13) Reaction of 9,11-diphenyl-10H-cyclopenta[e]pyren-10-one (11, 100 mg, 0.246 mmol), 2,5-bis(trimethylsilyl)-1,4-phenylene bis(trifluoromethanesulfonate) (1, 116 mg, 0.224 mmol), and CsF (41 mg, 0.269 mmol) in MeCN–CH2Cl2 (2:1; 9 mL) afforded 13 (66 mg, 40%) as a yellow solid; mp 279–281 °C. 1H NMR (500 MHZ, CDCl3): δ = 8.11 (s, 1 H), 7.90–7.85 (m, 6 H), 7.82 (s, 1 H), 7.56–7.48 (m, 10 H), 7.35 (td, J = 7.9, 2.2 Hz, 2 H), 0.32 (s, 9 H) ppm. 13C NMR (126 MHz, CDCl3): δ = 153.0 (C), 141.7 (C), 141.4 (C), 137.3 (CH), 136.9 (C), 136.6 (C), 133.2 (C), 132.4 (2 CH), 132.2 (2 CH), 131.0 (C), 131.0 (C), 130.99 (C) 130.97 (C), 130.3 (C), 130.2 (C), 130.1 (C), 129.9 (C), 129.5 (2 CH), 129.4 (2 CH), 129.1 (CH), 129.0 (CH), 128.2 (CH), 128.1 (CH), 127.1 (CH), 127.1 (CH), 126.6 (CH), 126.4 (CH), 126.2 (C), 126.1 (C), 125.1 (CH), 125.0 (CH), 118.5 (q, J = 325 Hz, CF3), 116.1 (CH), –0.6 (3 CH3) ppm. MS (EI): m/z (%) = 674 (100) [M+], 541 (53), 448 (16). 5,6,7,8-Tetraphenyl-3-(trimethylsilyl)anthracen-2-yl Trifluoromethanesulfonate (17) Reaction of 2,3,4,5-tetraphenylcyclopenta-2,4-dien-1-one (10, 126 mg, 0.329 mmol), 3,6-bis(trimethylsilyl)-naphthalene-2,7-diyl bis(trifluoromethanesulfonate) (2, 115 mg, 0.299 mmol), and CsF (55 mg, 0.359 mmol) in MeCN–CH2Cl2 (2:1; 9 mL) afforded 17 (84 mg, 40%) as a white solid; mp 223–225 °C. 1H NMR (300 MHZ, CDCl3): δ = 8.27 (s, 1 H), 8.22 (s, 1 H), 8.04 (s, 1 H), 7.82 (s, 1 H), 7.39–7.21 (m, 10 H), 7.01–6.78 (m, 10 H), 0.43 (s, 9 H) ppm. 13C NMR (75 MHz, CDCl3): δ = 152.4 (C), 140.5 (2 C), 139.91 (C), 139.59 (C), 139.52 (C), 139.4 (C), 139.0 (CH), 138.6 (C), 138.3 (C), 132.1 (C), 131.7 (C), 131.6 (CH), 131.6 (CH), 131.4 (CH), 129.6 (C), 128.1 (CH), 128.0 (CH), 127.0 (CH), 126.9 (CH), 126.9 (CH), 126.8 (CH), 126.4 (CH), 125.7 (CH), 116.2 (CH), –0.4 (3 CH3) ppm. MS (MALDI-TOF): m/z = 702 [M+]. 9,16-Diphenyl-13-(trimethylsilyl)dibenzo[a,c]tetracen-12-yl Trifluoromethanesulfonate (18) Reaction of 1,3-diphenyl-2H-cyclopenta[l]phenanthren-2-one (4, 148 mg, 0.388 mmol), 3,6-bis(trimethylsilyl)-naphthalene-2,7-diyl bis(trifluoromethanesulfonate) (2, 200 mg, 0.353 mmol), and CsF (65 mg, 0.424 mmol) in MeCN–CH2Cl2 (2:1; 9 mL) afforded 18 (50 mg, 21%) as a yellow solid. 1H NMR (500 MHZ, CDCl3): δ = 8.51 (s, 1 H), 8.46 (s, 1 H), 8.18 (d, J = 7.9 Hz, 2 H), 8.05 (s, 1 H), 7.84 (s, 1 H), 7.66–7.54 (m, 10 H), 7.42 (t, J = 8.0 Hz, 2 H), 7.32 (t, J = 7.5 Hz, 2 H), 6.95 (t, J = 7.7 Hz, 2 H), 0.43 (s, 9 H) ppm. 13C NMR (126 MHz, CDCl3): δ = 152.4 (C), 141.6 (2 C), 141.5 (2 C), 139.0 (CH), 135.4 (C), 135.0 (C), 133.0 (2 CH), 133.0 (2 CH), 132.6 (C), 132.6 (C), 131.8 (C), 131.5 (C), 131.5 (C), 131.4 (C), 131.2 (C), 131.0 (CH), 130.9 (CH), 130.0 (C), 129.6 (2 CH), 129.5 (2 CH), 128.3 (CH), 128.2 (CH), 128.06 (C), 127.6 (CH), 127.6 (CH), 126.5 (CH), 126.3 (CH), 126.0 (CH), 123.7 (CH), 118.2 (q, J = 321 Hz, CF3), 116.3 (CH), –0.4 (CH3) ppm. MS (MALDI-TOF): m/z = 700 [M+]. 9,16-Diphenyl-13-(trimethylsilyl)dibenzo[de,uv]pentacen-12-yl Trifluoromethanesulfonate (19) Reaction of 9,11-diphenyl-10H-cyclopenta[e]pyren-10-one (11, 118 mg, 0.290 mmol), 3,6-bis(trimethylsilyl)-naphthalene-2,7-diyl bis(trifluoromethanesulfonate) (2, 150 mg, 0.264 mmol), and CsF (48 mg, 0.317 mmol) in MeCN–CH2Cl2 (2:1; 9 mL) afforded 19 (46 mg, 24%) as a yellow solid. 1H NMR (500 MHZ, CDCl3): δ = 8.52 (s, 1 H), 8.47 (s, 1 H), 8.06 (s, 1 H), 7.85 (m, 3 H), 7.82 (d, J = 7.7 Hz, 2 H), 7.73 (t, J = 8.4 Hz, 2 H), 7.65–7.57 (m, 10 H), 7.29 (td, J = 7.9, 1.2 Hz, 2 H), 0.44 (s, 9 H) ppm. 13C NMR (126 MHz, CDCl3): δ = 152.4 (C), 142.1 (C), 142.0 (C), 139.1 (CH), 136.6 (C), 136.6 (C), 132.8 (2 CH), 132.76 (2 CH), 132.0 (C), 131.6 (C), 131.6 (C), 131.3 (C), 131.0 (C), 130.9 (C), 130.4 (C), 130.4 (C), 130.1 (C), 129.7 (CH), 129.6 (CH), 129.4 (CH), 129.3 (CH), 128.2 (CH), 128.1 (CH), 127.0 (CH), 127.0 (CH), 126.7 (CH), 126.6 (CH), 126.6 (CH), 126.4 (C), 126.3 (C), 126.1 (CH), 125.1 (CH), 125.1 (C), 118.2 (q, J = 322 Hz, CF3), 116.29 (CH), 116.28 (CH), –0.43 (3 CH3) ppm. MS (MALDI-TOF): m/z = 724 [M+]. 17 The use of neat MeCN or CH2Cl2 resulted in lower conversions due to the poor solubility of either the diene (in MeCN) or the CsF (in CH2Cl2). On the other hand the use of TBAF as the fluoride source afforded lower yields of the expected triflates.